Lars Chittka is the founder of the Research Centre for Psychology at Queen Mary, University of London. He has been an Editor of Biology’s leading open access journal PLoS Biology (IF=11.5) since 2004, and has also been on the Editorial Board of the venerable Proc Roy Soc Lond B (IF=5.4; 2010-2012) and the Quarterly Review of Biology (IF=7.7; 2004-2010); he is a member of the Faculty of 1000, and was an ERC Panel Chair (Consolidator Grants LS8, 2010-2013). 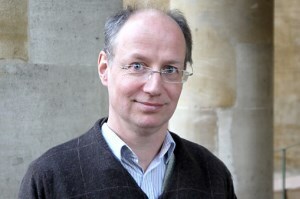 Lars Chittka is a recipient of the Royal Society Wolfson Research Merit Award and an ERC Advanced Grant. He is also an elected Fellow of the Linnean Society (FLS) the Royal Entomological Society (FRES) as well as the Royal Society of Biology (FRSB). He received the Lesley Goodman Award of the Royal Entomological Society in 2006, with Dr. T. Doering. His current H-index is 53 (Web of Knowledge, Jan 2016)." Work in the Chittka lab is poised at the intersection between sensory physiology and learning psychology on the one hand, and evolutionary ecology on the other. Why do animals have the sensory systems they do? How do they use them in their natural foraging environment? How do cognitive-behavioural processes function in the economy of nature? Pollinator-plant interactions have been used as a model system to study these questions. Bees have been the organisms of choice in most of these studies, because their colonies can be easily kept, their experience can be readily controlled, they have a rich behavioural repertoire and amazing learning capacities. Members of the team have been particularly interested in mutual evolutionary and ecological influences of insect colour vision and flower colour signals, and insect learning and flower advertising. In addition, they have studied bee navigation, including the question of how bees use spatial memory to navigate among several rewarded sites. Recently, Chittka has also become interested in the evolution of cognitive capacities and communication, and the pollination biology of invasive species. Work in the Chittka lab has made use of field studies, as well as experimental studies with computer-controlled behavioural tests, computer simulations, and phylogenetic analyses. Many of Chittka’s former PhD students and postdocs have moved on to become P.I.s at prestigious academic institutions.